On An Overgrown Path: Are classical music journalists above criticism? 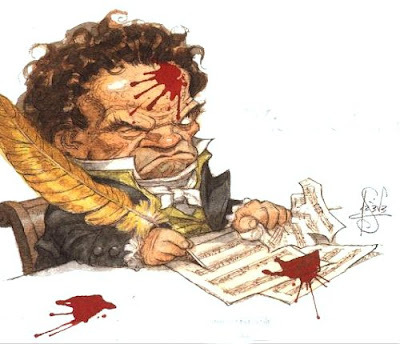 Are classical music journalists above criticism? There are lessons for classical music in this week's independent report about relationships between the UK media and police. In her report former parliamentary commissioner Elizabeth Filkin warns that a too-close relationship between senior Metropolitan police officers and sections of the media has compromised the ability of both to investigate each other and has damaged trust. Filkin also concludes that a lack of transparency about the relationship between police and media has led to damaging speculation and perceptions. It is important that a similar lack of transparency about the relationship between journalists and classical music institutions does not damage trust and cause speculation. The likelihood of this happening has increased as the available media has expanded to include blogs and social networks. Perks such as free CDs and concert tickets and the occasional jolly to hear Sean Rafferty in Birmingham or an orchestra in somewhere exotic like Rome have been around a long time. But increasingly journalists are taking paid for work from music institutions, and that must inevitably lead to problems of trust. Because, as a perceptive tweet about the tobacco funding debate pointed out, if you accept a payment you are establishing a relationship, and that is a form of endorsement. The shift towards citizen journalism has been accompanied by another unremarked but important change. Today the role of the journalist is seen solely as informing the public, whereas in the past journalists also provided an essential check and balance to the artistic policies of music institutions. Which means the creative tension between institution and critic has been replaced by a cosy alliance. We must avoid this debate being short circuited by the response that journalists cannot survive without commissions from music instititions. Just like bank funding, a financial relationship betweeen the critic and criticised may be here to stay. But, as with bank and particularly tobacco funding, the relationship needs to be much more transparent and this quote from the website of investigative journalist George Monbiot is a good starting point for the move towards transparency. I believe that everyone who steps into public life should be obliged to show on whose behalf they are speaking: in other words who is paying them, and how much. I would like to see journalists, like MPs, become subject to a mandatory register of interests. But until that time I hope to encourage other journalists to declare the sources of their income voluntarily – by declaring mine. Monbiot goes on to report that his annual payment from the Guardian to supply columns, blog posts and other material is £62,207. Now Monbiot is an established journalist and doubtless deserves that fee. But £62K is no small sum, and quite correctly he believes it is material and should be declared. Now let's assume for a minute that you have two articles about a concert series to read. One is from a journalist who declares he has no financial relationship with the orchestra promoting the concert series. The other one is from a journalist who declares he is paid £62,207 a year for contributing to the orchestra's website and promotional material. Which article would you trust? Paul, don't forget that the BBC is a British arts org. I wonder how much it pays Norman Lebrecht and Tom Service a year? This post was sparked by a comment left by a reader who is also a high profile blogger on my recent post about the Vienna New Year's day concert. The reader took exception to my criticism of the BBC coverage of the Vienna concert but omitted to volunteer the information that he had been paid by the BBC as one of the presenters of the previous year's concert. His relationship with the BBC does not exclude him from commenting. But it is certainly material given the context of his comment. Glad to have provoked further debate. I didn't think my 5 minutes of air time on the radio version of a previous broadcast merited comment... for one thing, those sorts of opening gambits can appear like bragging. "Before I comment on this, let me tell you all that I once met Ian Bostridge, and thought he was a delightful chap, but..." etc. You are right that impartiality is increasingly difficult. Particularly if you, like me, write for a number of institutions across Britain and elsewhere. Recently, I understand an esteemed musician recently refused to be interviewed by me because I had written two negative responses to their recent recordings on the blog (both CDs of which had been sent to me free of charge - not always the case). And you'll note that there are a number of not so positive reviews on my blog about the very BBC orchestras you have seen fit to praise. Ultimately, it's a matter of measuring one's tone, as well as speaking out. And yet... we shouldn't have to put ourselves in the position of stealing our own thunder. As primarily independent commentators - particularly within your recent series of articles - we can say what others can't. You are, far and away, the best at doing that, if sometimes I think you go too far. Still, the posts on your blog I most admire and have re-read are those in which you have had personal involvement - your travel journals, the retreats, working with the Britten Sinfonia which directly led to my love of Esenvalds (thank you). If only we had George Monbiot's salary... or anything near it.